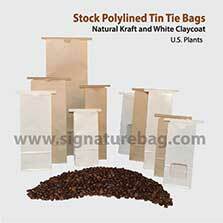 Coffee Industry for offering a wide variety Wholesale and Retail Packaging across the board. Everything from Gourmet Coffee, Pet Treats, Cookies, Candy, Baking Mixes, Medical-Dental Products, Soil Sample Bags, Medicinal and Recreational Marijuana Packaging, and much more. 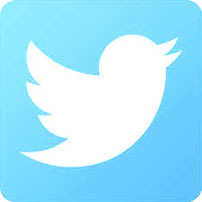 Since 1996, we have been Dedicated to the Gourmet Food and Packaging Industry. 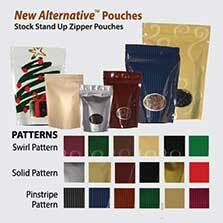 Offering Custom Paper Tin Tie Bags, Roll Stock Film, Foil Coffee Bags, Stand Up Food Pouches, and other types of Custom Packaging solutions for all Businesses! 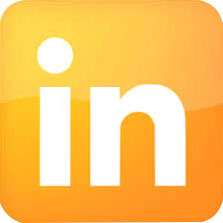 Whether you are a Fortune 500 Company or a Start – up, We can help! Newer Short Run Digital Print is done with the HP 20000.This machine is actually a US$ 1.1 million laser printing press that prints all your art CMYK and produces photo quality print. 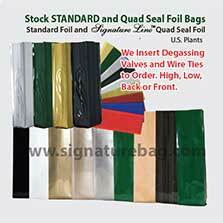 We then laminate and convert into as few as 5,000 bags or pouches. 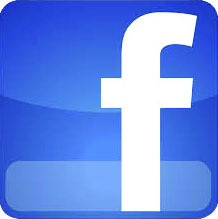 However, low quantities can be quite expensive. Flexographic Print is our most common custom print on paper in the U.S. for mainly production of the polylined paper tin tie bags. Flexo print has come a long way in quality print in custom bags. We also stock standard sizes in plain Natural Kraft and White Claycoat. 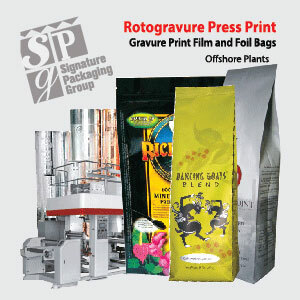 Gravure Print is our most common print on film and foil in our offshore plants in Taiwan, South Korea, and China. Gravure print is photo quality and used for high barrier all film and foil side gusset bags, stand up pouches, and quad seal box/flat bottom bags. 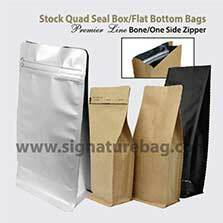 We stock many colors and sizes of bag to suit any packaging need. "TOP 10 LEADER IN THE SPECIALTY FOOD AND GOURMET COFFEE PACKAGING INDUSTRY!"